This wonderful film highlights spunky, gutsy, brave women, whose go-for-it attitudes made aviation history. 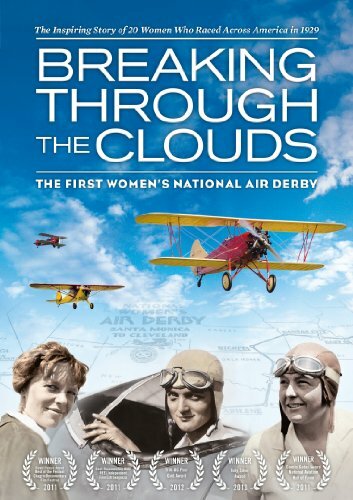 BREAKING THROUGH THE CLOUDS: The First Women’s National Air Derby is an award-winning documentary that showcases ACTUAL FOOTAGE of the 1929 air race, some that had not been seen since the race itself. As a character driven documentary, the women's personalities shine, from the cigar smoking, sailor swearing antics of Pancho Barnes, to the wildly celebrated Amelia Earhart and the glamorous, all American girl, Ruth Elder. Interviews with family members of the pilots and people who knew the racers bring a personal connection, adding an enormous emotional edge to the story. Aviation historians provide a framework of the monumental tasks these twenty ambassadors of aviation overcame, and modern day pilots including National Aerobatic Champion, PATTY WAGSTAFF, put into perspective the enormity of the women's accomplishments. 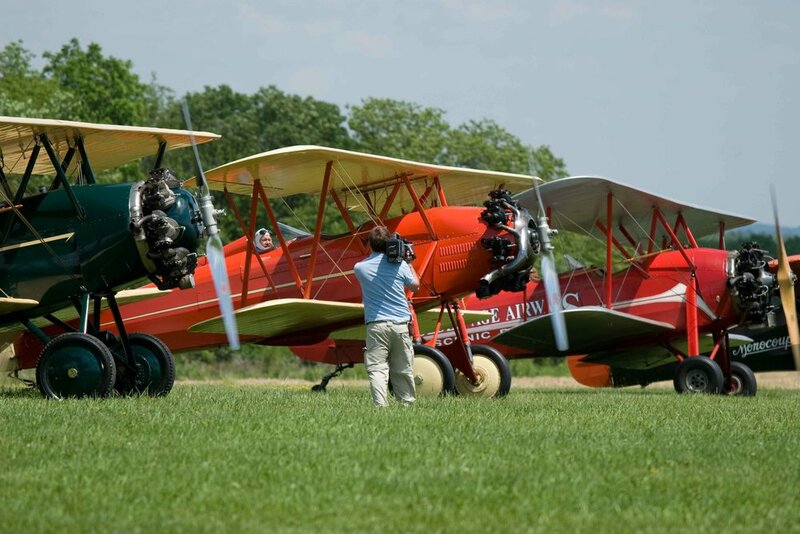 AERIAL RECREATIONS with brightly colored planes similar to what the women flew in the derby help put the viewer in the pilot’s seat. Expertly researched, beautifully shot, and filled with carefully restored footage of the derby, some of which has not been seen in over 80 years, Breaking Through The Clouds will leave you inspired. THE BREAKING THROUGH THE CLOUDS DVD IS $25 (Plus Shipping & handling). Please note that by clicking the button below, you will be redirected to the paypal website. Your receipt will show a purchase from Archetypal Images, LLC. PREFER TO ORDER A DVD BY CHECK? No Problem (if you are in the United States). Checks may be mailed to Archetypal Images, LLC. PO Box 1487, Columbia, MD 21044. Please email Heather@BreakingThroughTheClouds.com or call 865-242-7551 for shipping information and quantity (One DVD, including shipping within the U.S. is $31.95). Be sure to specify the name and address where the DVD is to be mailed. LEGENDARY PILOT ELINOR SMITH SULLIVAN, a peer of the women in the derby, gave her last on camera interview. She tells her infamous story of FLYING UNDER 4 EAST NYC BRIDGES. Purchase Extended Version/Producer's cut of the DVD directly from the producer on this page. Signings and dedications are available. Purchase Extended Version of DVD at Amazon.com (No signings or dedications available). License the film for a private Screening (contact Heather@BreakingThroughTheClouds.com), Libraries, or Schools. 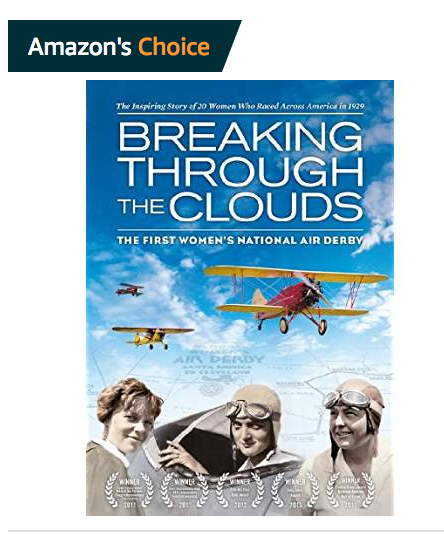 Breaking Through the Clouds: The First Women's National Air Derby has received 27 Five Star Reviews and is an "Amazon Choice." It is available at Amazon as a DVD. Breaking Through the Clouds preserves women's history, aviation's history and a slice of America's history. It was produced by an independent artist with a passion to tell this story to inspire others. Each purchase, recommendation, testimonial, comment of support, and stories of life positively affected as a result of BTTC is a gift of reciprocity. Previously I have posted BTTC on Vimeo and Amazon's Video On Demand Platform. Unfortunately Amazon only pays 20 CENTS per viewing of the film. While I believe in sharing this film as much as possible, I have dedicated an enormous amount of time and money to produce the documentary. It is not a hobby, but my livelihood. To pay an artist 20 cents seems an unfair way to support the creators of the content making the site possible. I have to draw a line when I feel undervalued for my work. Vimeo creates a much kinder atmosphere for artists but they do not receive the traffic that Amazon does so I will continue searching for the right Video on Demand home for the film and post here when available. In the meantime, the DVD is still for sale on Amazon or through this website. Thank you for your understanding, patience, and support. Heather Taylor, Independent Producer/Director of BTTC. We respect your privacy. Your email address is only used for the BTTC newsletter which comes out approximately 4 times a year.